In December 2016, the Tennessee Department of Health (TDH), the Nashville Civic Design Center (NCDC), and the Tennessee Chapter of the American Planning Association represented Tennessee as one of 28 states to receive funds from the American Planning Association’s Planners4Health grant. The third phase of APA’s Plan4Health initiative, these innovative funds were awarded to further build capacity to address population health goals and promote the inclusion of health in nontraditional sectors. TDH, NCDC, and the chapter spent the next nine months pursuing this health integration. Particular emphasis was placed on identifying gaps in healthy infrastructure resources, while institutionalizing health and planning in Tennessee through the onboarding and support of seven new positions in the state’s department of health. Work kicked off by assessing Tennessee’s existing health promoting planning efforts through the curation of 60 healthy infrastructure case studies. These studies outlined successful projects, master plans, and partnerships promoting health in their respective community. Each study was in turn highlighted as a best practice on the Tennessee Department of Health’s Healthy Places website. Comprising the second portion of the assessment phase, Healthy Places is an information hub for all things health and built environment. The website contains educational tools and resources, contacts for potential partner organizations and projects, and information about grants that promote health in diverse contexts. Following the assessment phase, two crucial resources were created to provide best practices and incentives around future health promoting infrastructure projects. The first, the Healthy Transect Design info sheets, are a series of four trifolds covering the rural, suburban, urban/main street, and center/district transects. 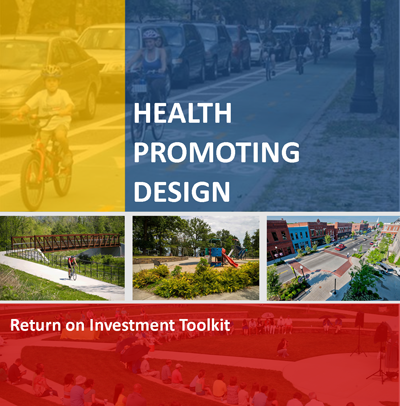 Each sheet includes a definition and description of health promoting community design features, case studies, and suggested policies to institutionalize suggested designs. The toolkit outlines the financial benefits of a health promoting built environment by outlining general financial returns a municipality could expect. It breaks returns into the categories of walkability, active transportation, bicycling and bike tourism, parks and greenspace, streets and roads, and trails. Collectively, the info sheets and toolkit offer guidelines towards building healthier communities, while outlining expected positive returns. 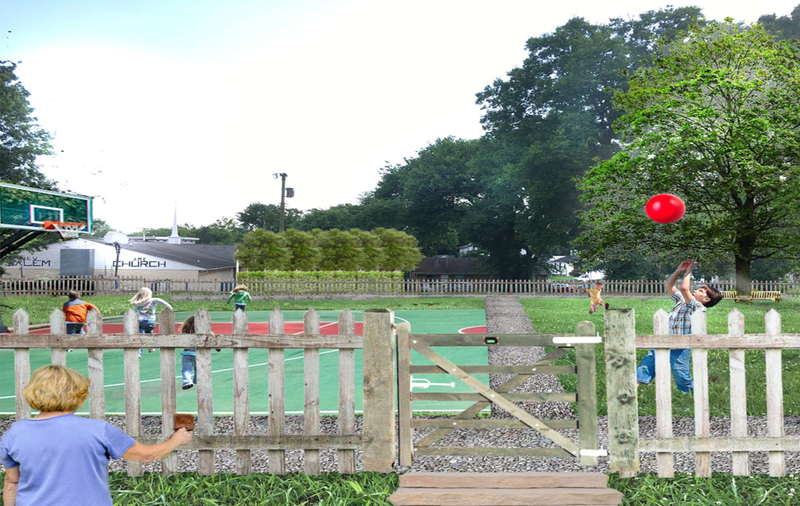 In seeking to implement these resources, NCDC commissioned three graduate students from the University of Tennessee Knoxville and Auburn University to develop conceptual renderings for a community park. The park, owned by a local church, is located within one of the fastest developing neighborhoods of Nashville. Despite regular offers from developers on the half-acre park, the church maintains a commitment to keep its land as open and accessible public greenspace. The renderings were developed in partnership with church leadership, and thanks to Planners4Health, were offered to the church at no cost. The final renderings are now being utilized to leverage funding towards renovating the entirety of the park. Rendering of Phase 1 of possible future McKenzie Park. Image courtesy Planners4Health TN. In an effort to institutionalize a healthy community framework, the core grant activities coalesced around implementing the orientation, training, and ongoing support of TDH’s Healthy Development Coordinators (HDC). A new position within TDH, the HDCs act as liaison between the health and planning worlds, facilitating cross-sector partnerships while advocating and supporting healthy infrastructure projects within their respective regions. Using Planners4Health funds, a three-day training was developed in Manchester, Tennessee, that covered basic elements of health, planning, and community engagement. Throughout this original training, over 20 speakers representing different state, regional, and local organizations presented and co-trained the HDCs. The presence of so many groups led to strengthened relationships, and development of new partnerships across the state. By necessity of their role, the HDCs are expected to work with both health and non-health actors at all levels. To support the educational needs of engaging diverse fields, Planners4Health funds were used to assist in ongoing support, including the hosting of monthly educational webinars. Each webinar revolves around a different topic chosen by the HDCs, including food systems, historic preservation, and placemaking. In total, eight webinars have been scheduled and are open to the public. Each also contains presentations by content experts that often work outside a traditional public health or planning role. The goal for these HDCs is to be established, on-the-ground staff, supporting and facilitating health-promoting projects across Tennessee. With the authority of the state health department, the HDCs are uniquely positions to capitalize upon existing relationships, develop new ones, and identify avenues towards closing health and equity gaps across Tennessee. Our hope is to create a new model of health and planning advocates, that can be replicated elsewhere to strengthen the awareness of the built environment’s effects on public health. 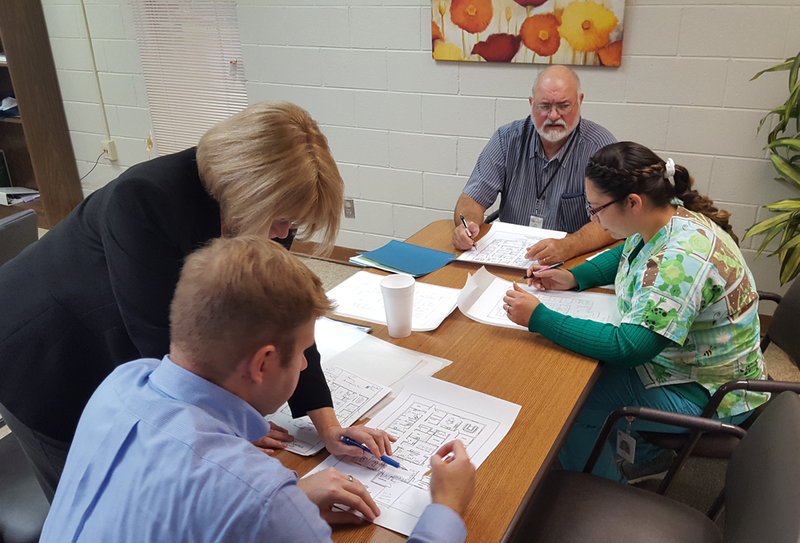 Tennessee clinical staff design charrette. Image courtesy Planners4Health TN. To assist with undertaking this ambitious scope of work, a 19-member interdisciplinary task force was assembled to provide ongoing project guidance and support. Task force members represented all levels of health, planning, and community development across the state, and convened regularly for monthly check ins. These members collectively comprise decades of collaboration and partnerships, which aided in the supportive network that carried Planners4Health in TN. Throughout the duration of the grant timeline, dozens of organizations, some completely new to planning and health, were brought into the grant activities. Through Planners4Health, support and training was provided to the entire task force in the form of regular webinars, monthly cohort checkins, registration, and training during both APA’s National Planning Conference and Policy and Advocacy Conference, and general ongoing logistics assistance as needed. If it wasn’t for the strong team at APA, and their commitment to shaping healthier communities, Tennessee wouldn’t have experienced the level of success that was achieved. Top image: Rendering of Phase 2 of possible future McKenzie Park. Image courtesy Planners4Health TN. Michael Thompson is a research fellow at the Nashville Civic Design Center.